Prime Minister Recep Tayyip Erdogan said Friday that Turkey would not be deterred by the possible diplomatic consequences if it decides to stage a cross-border offensive into Iraq against Kurdish rebels. "If such an option is chosen, whatever its price, it will be paid," Erdogan told reporters in response to a question about the international repercussions of such a decision, which would strain ties with the United States and Iraq. "There could be pros and cons of such a decision, but what is important is our country's interests." Erdogan also had harsh words for the United States, which opposes a Turkish incursion into Iraq because it could disrupt one of its few relatively stable areas. "Did they seek permission from anyone when they came from a distance of 10,000 kilometers and hit Iraq?" he said. "We do not need anyone else's advice." Analysts say Turkey could be less restrained about defying the United States because of a U.S. congressional committee's approval of a resolution labeling the mass killings of Armenians around the time of World War I as genocide. "Democrats are harming the future of the United States and are encouraging anti-American sentiments," Erdogan said. Democratic Party leaders in the House of Representatives support the resolution. 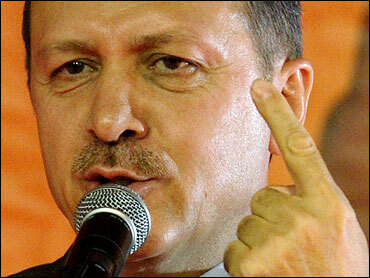 Erdogan said Turkey was ready to sacrifice good ties with Washington if necessary. "Let it snap from wherever it gets thin," Erdogan said using a Turkish expression that means breaking ties with someone or something. At issue in the resolution is the killing of up to 1.5 million Armenians by Ottoman Turks. Turkey denies that the deaths constituted genocide, saying the toll has been inflated, and those killed were victims of civil war and unrest that killed Muslims as well as the overwhelmingly Christian Armenians. Murat Mercan, head of the Turkish parliament's foreign relations committee, accused U.S. legislators of snubbing ties with Turkey. "In the United States, there are several narrow-minded legislators who can't think of their own interests and who cannot understand the importance of Turkey," Mercan said. Turkey, a key supply route for U.S. troops in Iraq, recalled its ambassador to Washington for consultations and warned of serious repercussions if the U.S. Congress passes the resolution. CBS News was outside the Turkish Ambassador's residence in Washington Thursday when he came out and spoke briefly to reporters. Nabi Sensoy, seen at left in a 2003 file photo, confirmed that he was being recalled to Turkey. "I'm asked to come back to Turkey for consultations. This is a normal affair, especially after certain important developments take place… They will normally ask what has happened and what the prospects are, and I will share with the government my own experiences in this country," Sensoy said. Turkish authorities have refused to comment on whether Turkey might shut down Incirlik air base in southern Turkey, a major cargo hub for U.S. and allied military forces in Iraq and Afghanistan. Turkey's Mediterranean port of Iskenderun is also used to ferry goods to American troops. However, sources tell CBS News' Charlie Wolfson at the State Department, "at least for now, the Turks are not restricting use of Incirlik air base or taking other steps that might interfere with the U.S. military's operations." The Yeni Safak newspaper, which is close to the Turkish government, said Friday that Incirlik and $15 billion worth of defense contracts, including purchase of warplanes, missile and radar systems, could be reviewed. Turkey could also prevent U.S. firms from taking part in new contracts, Yeni Safak said. Wolfson reports the disagreement has forced the Bush administration to engage in a political blitz to try and avoid a diplomatic disaster. "Having failed to prevent the House committee vote, everyone from President Bush to Secretary Rice, Secretary Gates and a score of other senior officials are scrambling to prevent passage of the resolution by the full House." Erdogan said the resolution in the U.S. Congress would hamper all efforts to improve ties between Turkey and Armenia, who do not have diplomatic relations because of the dispute. Turkey also closed its border with Armenia in 1993 during a war between Armenia and Azerbaijan, a Muslim ally of Ankara. The move hurt the economy of tiny, landlocked Armenia. "Are relations between Turkey and Armenia possible? The way things are going, no!" Erdogan said. Erdogan said Turkey has long been seeking the cooperation of Iraq and the United States in its fight against Kurdish guerrillas, but there has been no crackdown on the rebel Kurdistan Workers Party, which has bases in Iraq. Erdogan said a recent anti-terrorism deal signed with Iraq was not valid since it had not been approved by Iraq's parliament yet. The Turkish parliament was expected to approve a government request to authorize an Iraq campaign as early as next week, after a holiday ending the Islamic holy month of Ramadan. "We are making necessary preparations to be ready in case we decide on a cross-border operation since we don't have patience to lose more time," Erdogan said, adding that Turkey has lost 30 people in rebel attacks over the past two weeks. A Turkish soldier was killed in a mine explosion on Thursday night on Mt. Gabar in southeastern Sirnak province, authorities said Friday. Turkish army units, backed by helicopter gunships, were hunting rebels in the rugged border area. Bahoz Erdal, a senior rebel commander, said the PKK fighters were moving further inside Turkey and taking new "positions" in the face of attacks from Turkey, pro-Kurdish Firat News Agency reported Friday. The agency is based in Belgium. The conflict has killed tens of thousands of people since 1984.